My husband and I love beets. This is a vegetable that I buy regularly when I am at the store. Beets are such a nutritious food and I love the color. The red beets bake into a delicious purple color. 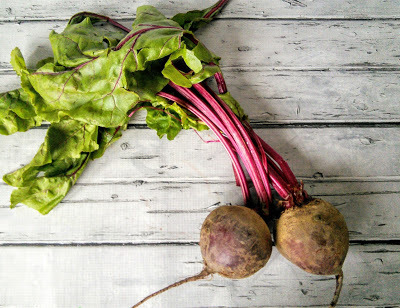 Did you know that beets can be used as a natural dye? When Easter rolls around this year boil some beets in a pot of water and make sure to save the purple water to dye the Easter eggs. While my husband loves the taste of beets, he is not a fan of the purple color as it can also change your "number two" to purple. So if you want your kids to eat beets just tell them that the beets will give them purple poop. 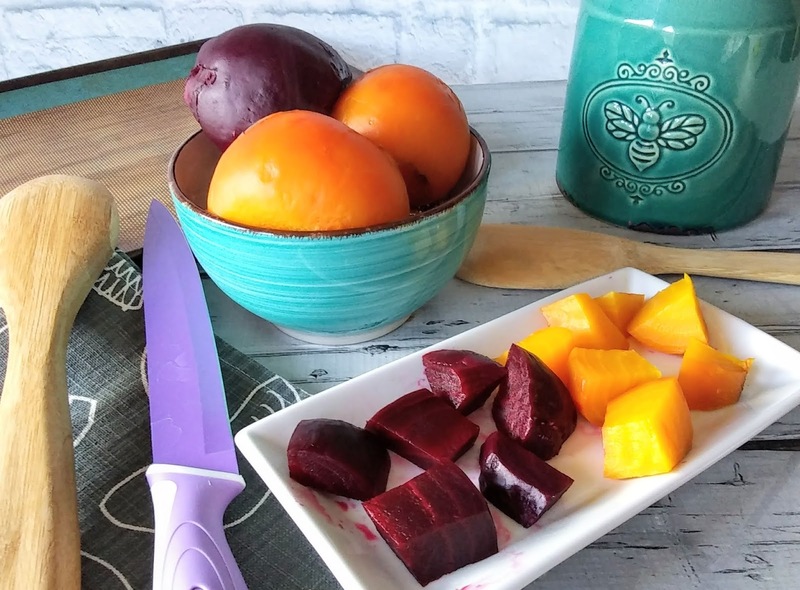 If you are not a fan of the staining that happens from the red beets, you can buy golden beets. 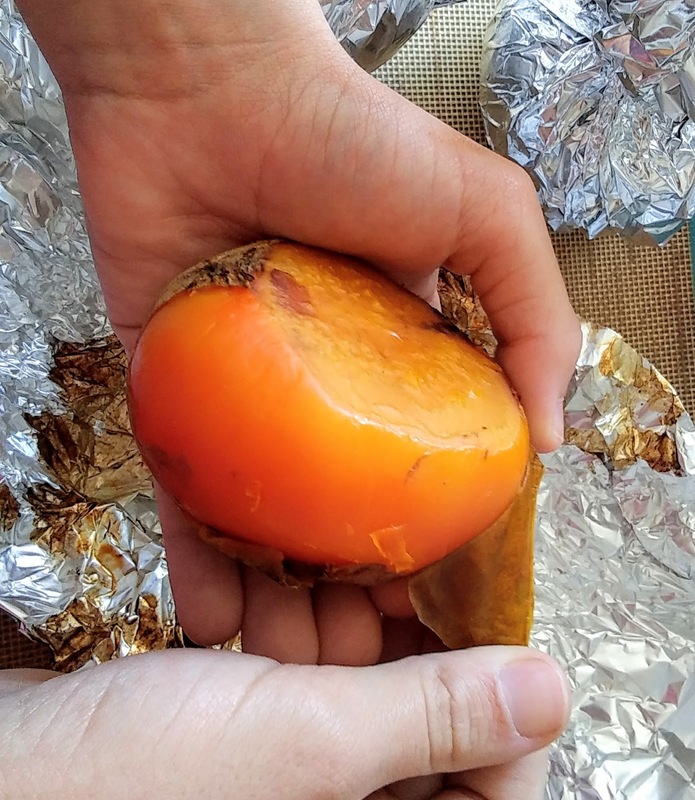 Golden beets taste very similar to the red beets and cook the same way. There are many ways that you can cook beets. You can roast them in the oven, boil them, cook them in the slow cooker, or even roast them in the pressure cooker. My favorite way to cook beets is in the pressure cooker but I will also oven roast them if I am roasting other veggies like my Rainbow Brussels Sprouts. There is no need to peel the beets when you roast them in the oven. The secret is to wrap the whole beets in foil and the steam then makes it so easy to remove the peels after they bake. All you have to do is scrub the beets and cut off the ends. 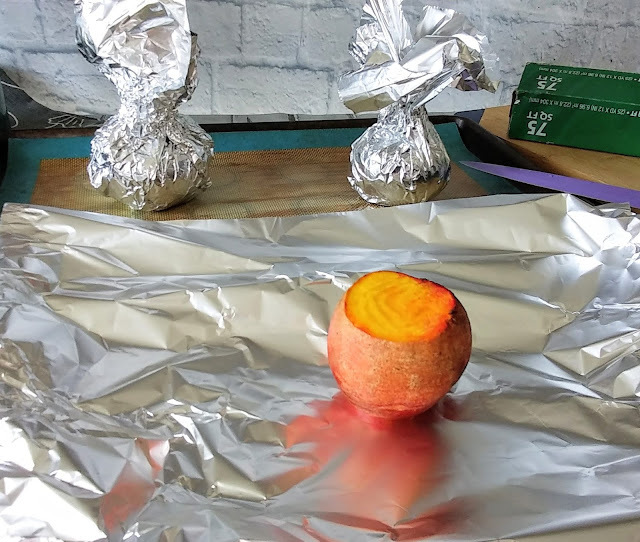 Then wrap the beets tightly with foil, making sure to pinch the foil at the top of the beet so the beet juices do not escape. I like to also place the beets on a baking sheet just in case the beets fall over so I do not have a mess to clean up on the bottom of my oven. If you want the beets to have a crispy outside, then you can cut the beets into pieces after they cook. Then toss the beet pieces in a small amount of oil and bake them for a bit longer. 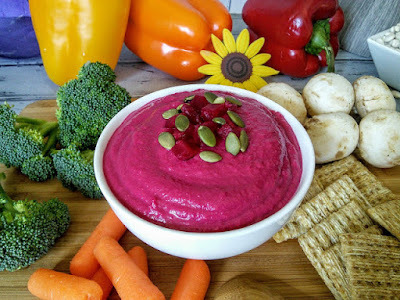 I like to make my beets this way when I am making my roasted beet salad but when I make my beet hummus then I don't bake them again for the crispy texture. You really need to check out my beet hummus recipe as it tastes just like the beet hummus from Lantana. Beets are loaded with awesome nutrition and are great for many vegetarian recipes. I love eating my beets with just a bit of salt and I love that they are plant-based. Even if you do not eat meatless meals, you can still enjoy beets. I am glad that beets are allowed on my dairy-free diet. Ever since I discovered my dairy allergy, I have been making more meals at home as it is hard to find places that serve vegan meals that are also soy-free. So many restaurants are serving gluten-free options but there are not many dairy-free options. Wash and scrub the beets with a vegetable brush. Cut off both ends on the beets. 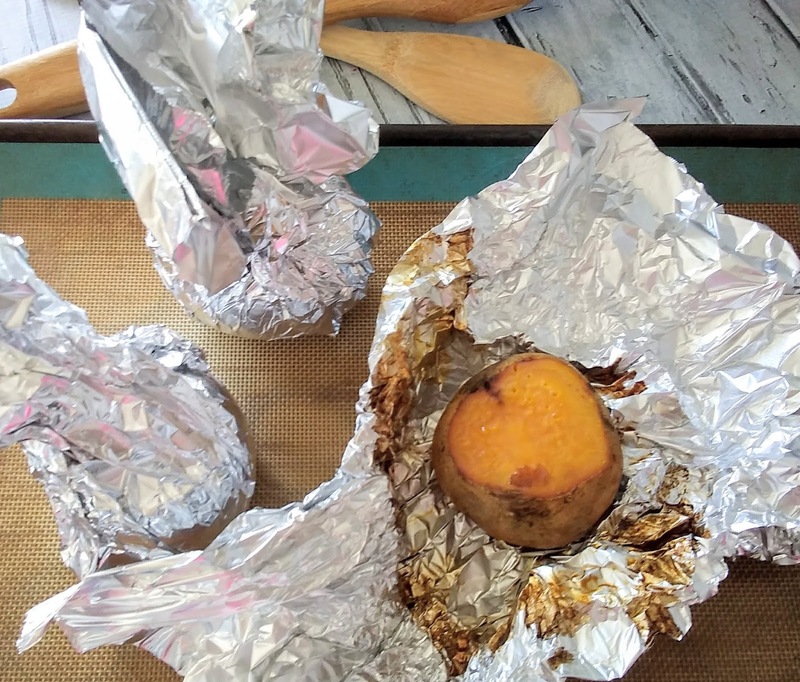 Wrap the beets in foil, making sure to seal the foil well to prevent leaks from the beet juice. I like to make the foil point upward. Place the beets on a cooking sheet and roast in the oven for an hour or until a fork is able to pierce the beet. Let the beets cool. Then unwrap the foil. Run the beets under cold water to peel off the skin. By running the beets under water, your hands are less likely to turn purple. You can also wear gloves to avoid staining your hands purple. If your hands do turn purple, it washes off with soap. For beets with a crispy texture, you can cut the whole beets into pieces and toss the beets in a bit of oil. Then roast them in the oven for an additional 10-20 minutes. Do you have a pressure cooker? 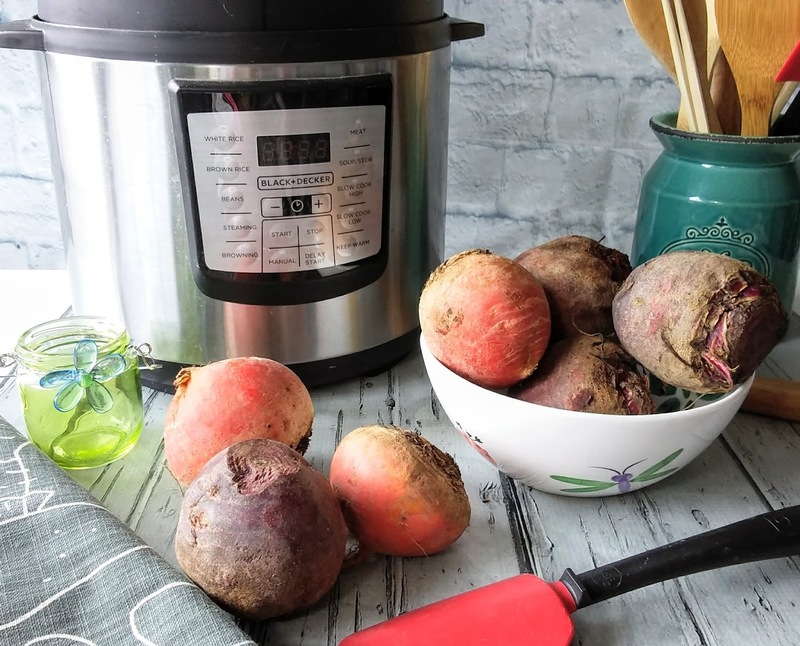 Check out a quicker way to cook fresh beets in a pressure cooker. The pressure cooker cooks the beets so much faster and easier. Now this is how I love eating my beets. Perfectly roasted and delicious. I really should start eating beets more often. I haven't had one in ages and I do like them. I might have to roast some too with dinner. This sounds like such a quite and simple way to do something different with beets! I am going to have to try them. Wow. I never thought about cooking beets like this. I'm so glad you shared your recipe. That humus looks so good too. I absolutely LOVE beets but have never made them myself. Maybe I need to add that to my list of food and wine goals for this year? Is that a pressure cooker that you have in the photo or is that an Instant Pot? Why have I never tried to roast a beet before? I usually just buy them pickled (delicious). I love beets and better when roasted as they develop a very nice flavor. I also enjoy them pickled, make them very often. And raw too go nice with lime juice. I do love beets, especially when they are roasted or pickled. I add them in salads usually. The only bad part is the mess they make. Beets are good but I don't like them. However the recipe looks great. I love beets but I've never cooked them myself. This recipe looks quick and easy, maybe I'll give it a try! I haven't had beets or even tried to cook them. I think they would add a nice variety to roasted veggies. My husband is not really a big fan of beets, so i never get to prepare them at home. But i love the way you've prepared it here, makes it look very appetising.